Because you increase your service, and therefore your return for your services is increased. It may not happen immediately. But, it will happen! Of course, one of the biggest rewards is…your own positive transformation. Learning from your experiences…turning insight into how you can apply fresh ideas and outlooks for your own business to serve others and work better at what you do. After all, you make your living and add meaning to your business and life by serving other people in some way. You will be using the Law of Service and Business to align yourself with opportunities. 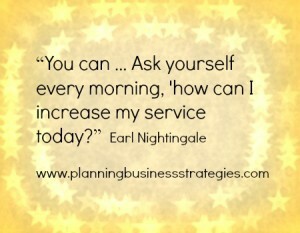 Earl Nightingale believed that people who concentrate on the service side of the scale find themselves profiting from all sorts of unique opportunities that others would call lucky. The Law of Service and Business shares that your success also comes from supporting your attitude of service, and giving value to others. How do you improve your service quality in your business? 1. Know, really know, your customers. That means that you ask them questions and listen to them. 2. Understand what keeps your customer’s up at night. 3. Know what’s important to them. 4. What important problem does your product or service solve? 5. How can you be of service? This is using the Law of Service and Business to improve your services. You have some excellent points. Thanks for sharing this. Alexandria Ingham recently posted..Should You Bother Blogging for Passive Income? Wonderful blog! Thank you for sharing. It is so important to know how your customers think and feel. Great tips! Yep, Tami – it seems to always fall back to really knowing our customers 🙂 Thank you so much for stopping by! Joan Harrington recently posted..Why Content Marketing? Thanks so much for stopping by once again, Joan – so glad you found this of help! !